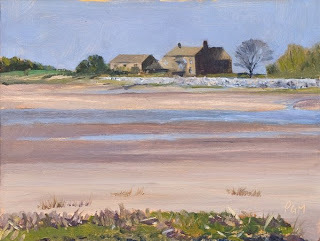 Low Tide, Sunderland Point. Oil on gessoed card 6"x8". It's great to have some settled warm weather and time to get outside with my paints. This painting took about three hours and while seemingly a simple subject I found it very difficult to control all the values and keep the elements of the painting relating correctly. Painting from life is to my mind the most difficult discipline in painting and shouldn't be avoided. Even a relatively simple subject rendered correctly will teach more than a hundred copied photos. There are many great painters working today who do this with consummate skill such as Josh Elliott, Frank Gardener and Glenn Dean, to name just a few.